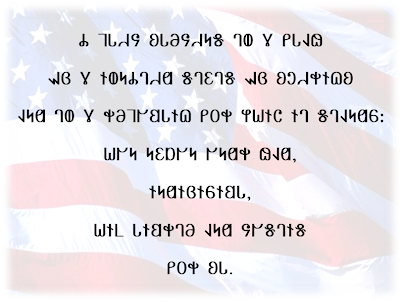 Following is a transliteration/transcription of the Pledge of Allegiance into Deseret Alphabet. Comments are welcome. Note that in this and all other text I produce here, I am attempting to capture the spellings that might have been used had these texts and words appeared in the Deseret Readers of the 1800's. Granted, I don't own any Deseret Readers, but I'm taking my best shot. Again, feedback would be welcome! I think it's great that you're doing this. 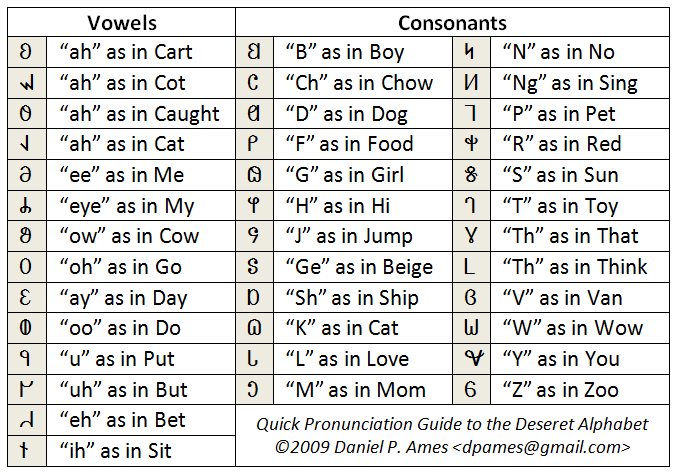 I would prefer you use the vowel 'aw' as in 'caught' in the word 'all' (since you seem to be using the more conservative vowels elsewhere), but it is still understandable. The only error seems to be the spelling of 'God', which I assume was not meant to be 'Gad' (rhyming with 'bad'). Keep up the good work! Just noticed this... yes indeed, God is misspelled as "Gad". I also agree with the commenter's point about All best being spelled with AH as in "caught" rather than AH as in "cart". To tease these two apart, it helps to imagine John F. Kennedy reading it. Would he say "all" with the same vowel sound he would use in "cart"... probably not.